Almost 5,000 people will be moved back into Mayo for future general elections following the publication of the latest Constituency Commission report which was published this week. The previous Constituency Commission report saw around 7,500 people moved from Mayo to Galway West and the county see its number of TDs drop from five to four, even with the return of the 4,873 people to the Mayo constituency for the next election the county will remain as a four seat constituency. The electoral divisions that have been returned to Mayo are the from the former Ballinrobe Rural District, Ballinrobe with 3,770 people, Kilcommon with 663 people and 460 people in Garrymore from the former Claremorris Rural District. However that still leaves towns and villages like Cong, Dalgan, Kilmaine, The Neale, Cross, Glenncorrib and Shrule isolated from the rest of Mayo in the Galway West Constituency. Speaking to the Mayo Advertiser this week, Fine Gael Cllr Patsy O'Brien who led a charge to have the areas of south Mayo which were bundled in with Galway West returned to the county told us, "I welcome Ballinrobe, Garrymore and Roundfort coming back into the constituency, with a special emphasis on Roundford which is my own area and we had the crazy situation of two thirds of it being in Galway West and one third of it being in Mayo last time. At least that is all back and I'll be hoping also in the light of this that the parish of Roundford on a local level will be brought back under the local government eye to the Claremorris area, because at the moment we have two thirds of it in the Claremorris Municipal District and one third in the Castlebar Municipal District. "For the people in the areas that have still be left out of Mayo and put in Galway West it is a hard pill to take, it's very hard to justify the system that would take the same number of people out of Galway West and put them into Galway East to bulk it up and then robbed the few from Mayo to put them into Galway West to keep their numbers up. There is terrible annoyance and frustration, people are very annoyed, they feel in national elections they have nothing to vote for. "They feel they have nothing in common with the candidates they have, no disrespect to them. They are Mayo people in and out, the fly the green and red flag outside their door and they have to go differently come elections. For councillors in the area not just me, but all the coucillors in the area, it makes it hard to get full support for things — it falls between two stools; it's a political island and can fall in a limbo. But one thing for sure is that when it comes to the people of south Mayo, I won't be found wanting when it comes to representing the people there. Fianna Fáil TD Lisa Chambers also welcomed the return of part of the annexed south of the county to Mayo saying, "I am delighted to see that Garrymore and Ballinrobe are being brought back into the Mayo constituency, this is certainly very welcome news for those living in those areas. The move of Ballinrobe to the Galway West constituency never sat easy with people living there and I am glad this wrong has been corrected. It was always my personal view that the Ballinrobe area should never have been moved into Galway West and our county boundary disregarded and it was clear that the people in the area had the same view. "The decision that was taken a few years back to shift our boundary was a bad one, the people living in the area were not happy and the new boundary simply did not work. What confounded matters was that Ballinrobe still remained under Mayo Local Authority and this confused matters in terms of who had responsibility for what” she said. While the return of part of the south of the county is a relief to the people in that area, there had been concerns that Mayo could loose some of it's population in the east and north of the county to other constituencies, but that didn't come to pass. 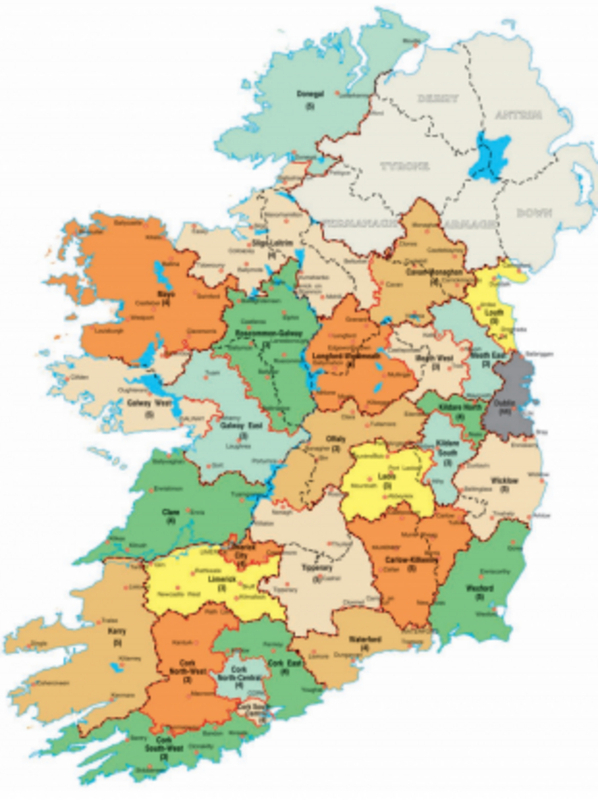 In its report the Constituency Commission did say that it gave consideration to two options of moving Mayo people into the Sligo-Leitrim constituency with the potential of 14,800 from Ballina or 8,400 from the Swinford and Charlestown areas to the other constituency, but they decided against that and moved some population from Roscommon to Sligo-Leitrim.